Edge Dance Company, London Contemporary Dance School’s postgraduate company, announced its 2018 tour which will run from 18 April – 9 July with performances in countries across Europe. This year’s 14 talented dancers hail from around the globe, from countries including Costa Rica, France, Hong Kong, Italy, Spain, Taiwan, USA and the UK. Edge is set to tour four specially commissioned new works this year. The company will bring technically challenging and expressive choreography to life as it performs pieces by internationally-acclaimed choreographers Philippe Blanchard (France), Tamsin Fitzgerald (UK), Athina Vahla (Greece) and Ben Wright (UK). 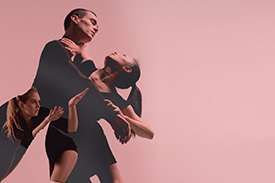 Edge has built a reputation for commissioning exciting new dance performed by outstanding young artists at the start of their professional careers. It is based at London Contemporary Dance School, committed to supporting dance development through international choreographic talent creating new work, alongside supporting established artists through its touring repertoire. Choreographers who have worked with the company include Trisha Brown, Wayne McGregor, Siobhan Davies, Hofesh Shechter, Tony Adigun, James Cousins, Ben Duke, Martin Forsberg, Javier De Frutos, Frauke Requardt, Tom Roden, Matthias Sperling, Joseph Toonga, Sasha Waltz, Alexander Whitley, Shobana Jeyasingh, Jorge Crecis and Yael Flexer. Between April and July, the company will tour to Austria, Dundee, Helsinki, Leeds, Hereford, London, Hexham, Exeter, Canterbury, Portugal and Italy. A performance at Guys Hospital will celebrate how watching dance can transform the experience for staff, patients and visitors, as part of Breathe Arts Health Research initiative, and the residency in Portugal includes teaching and creating new dance with 150 young people aged 3 – 25. The 19 dates across six countries include performing in Finland for the first time.